Thinking of joining us but not sure if we offer the right team for you? Each and every one of our employees contribute to our progress, so whatever team you join, you’ll have a part to play. Whether it’s Fundraising, Marketing and Communications, Operations, People, Resources or Finance – there will be a team to suit your skills. Find out more about our directorates below. We have a range of rewarding roles within our Operations Department. These are located at either our Southern Training Centre, Midlands Training Centre or in locations supporting our puppies in training or partnerships across the UK. 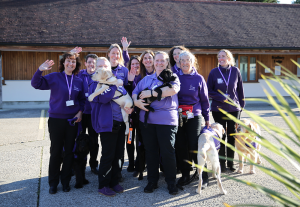 Our Operations Department is made up of several teams; breeding, puppy training, advanced training, dog welfare, housekeeping, applications and aftercare. Our Fundraising, Marketing and Communications teams offer varied and rewarding work every day. You will be in an important frontline position to support our partnerships by raising vital funds. You will also have the unique opportunity to raise awareness of Canine Partners, sharing your enthusiasm for our charitable work with people discovering us for the first time. We have a number of different functions in our offices to help support our work in our offices at Heyshott, West Sussex and Osgathorpe, Leicestershire. If you are interested in a career in finance, administration, resources or HR, you could put your skills to use in an organisation where you can really see the benefit of your hard work. The roles in our people, finance and resources teams play an important part in supporting the teams behind our amazing dogs and play just as big a part in transforming the lives of people with physical disabilities.